The PCM1798 is a monolithic CMOS integrated circuit that includes stereo digital-to-analog converters and support circuitry in a small 28-lead SSOP package. 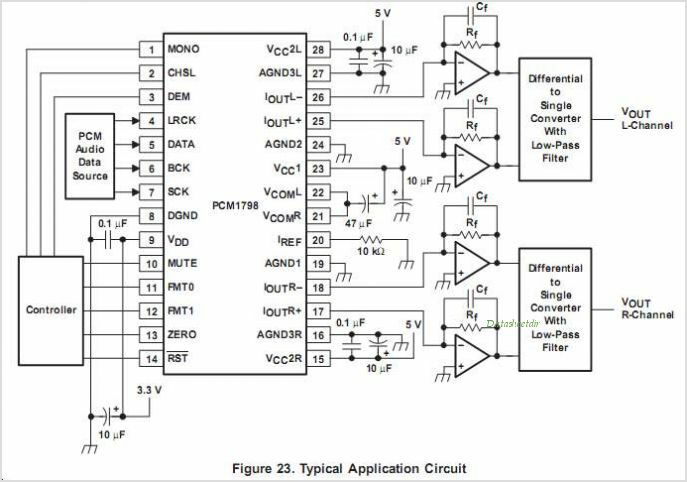 The Data Converters use TI?s advanced segment DAC architecture to achieve excellent dynamic performance and improved tolerance to Clock jitter. The PCM1798 provides balanced current outputs, allowing the user to optimize Analog performance externally. Sampling rates up to 200 kHz are supported. 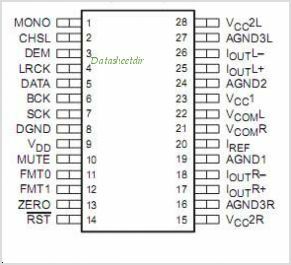 This is one package pinout of PCM1798,If you need more pinouts please download PCM1798's pdf datasheet. This is one application circuit of PCM1798,If you need more circuits,please download PCM1798's pdf datasheet.